I didn’t think part 5 would be quite so quick in turning up!! After typing out the quick Part 4 the other evening, I opened my emails the following morning, who had emailed me?? Yep your right, the one and only Dave Manton. I think he was just taking a quick break from being in his loft for the last few weeks looking for photo’s!! This on the road photo was a regular stop on the route to Moscow. This is dieseling your truck up Belarus style. 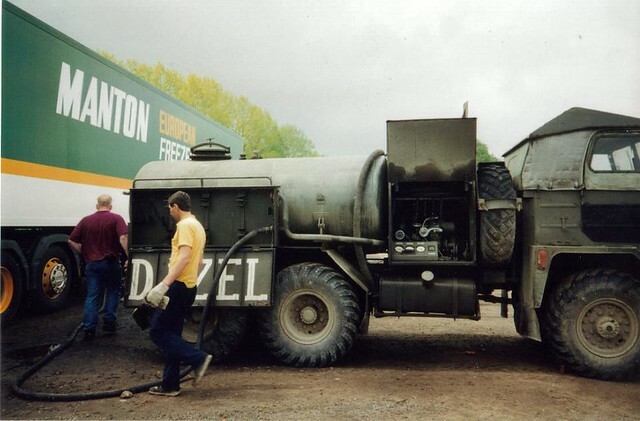 For a point can you tell me what type of Eastern European truck the fuel bowser is? I have no idea what so ever! Leave a comment or email me; ben@truckblog.co.uk and hopefully by the time you’ve worked out what it is, my friend and yours DM will have the next photo. This entry was posted in Drivers Photos, International Mega Trucking, Truck Detective by truckbloguk. Bookmark the permalink. Hi. The truck in the photo is certainly a Polish built ‘Star’ produced by Fabryka Samochodów Ciężarowych Star in town of Starachowice (hence the name). The model in the photo is most likely Star 660 built between 1965 and 1983. Unfortunetly I can’t find any info about it in English, only about manufacturer. Came across this blog by complete chance. That’s me in the photo on route to Moscow. Brings back some very happy memories.